I bet you didn’t know when you landed on this post you’d be taking a pop quiz! Don’t worry, there’s only one question and since it’s true or false, you’ve got a 50% chance of passing. Plus, I believe in you! Ready? Here it is. True or False: Growing an email list is one of the most important tools of an online business or blog? If you said true, do a little happy dance and give yourself a pat on the back! 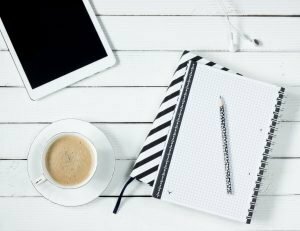 An email list is a must have tool for creative entrepreneurs and bloggers utilizing the online space. As true as this is, a lot of them put off starting an email list, so it’s not surprising many of them categorize it as one of their biggest regrets in relation to their business. So, why does something seemingly as insignificant as an email list hold so much power? Your email list is so important because it keeps you connected with your readers. You’d be right. 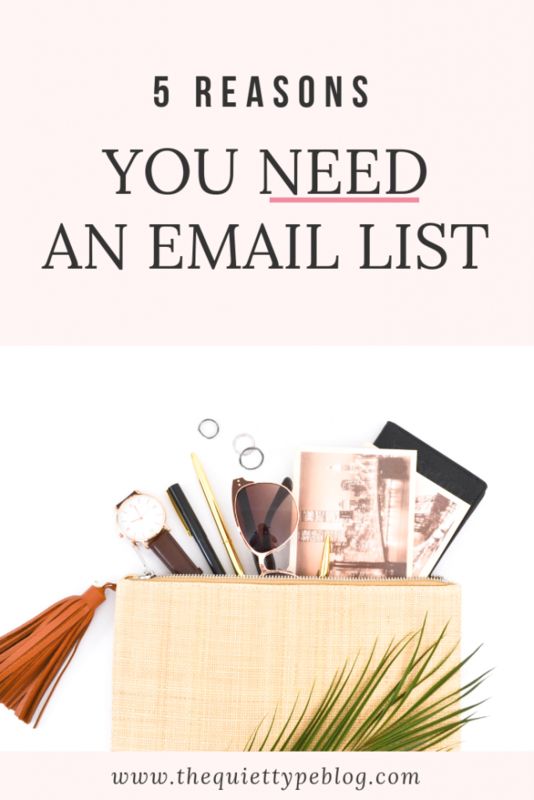 There are other ways to connect with your readers, but the beauty of an email list is that it gives you more opportunities to nurture that connection because it’s more personable. Rather than talking to the masses through social media captions or blog posts, the content you send to your email list is crafted in a way speaks directly to the reader…almost like a one-on-one conversation. Still not convinced? Have an email list but it’s been neglected while you focus on other things? Here are five reasons you need an email list. 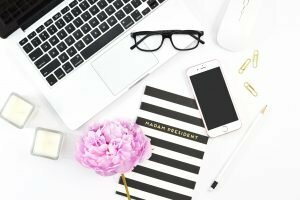 Don’t get me wrong, building a social media following is important for bloggers and creative entrepreneurs. Using social media offers a way to promote your content and connect with your audience, but growing your social media following shouldn’t be your main focus. Rather than just focusing on building a social media following, you should use it to drive your audience to your site and convert them into subscribers. Here are the two biggest reasons why. You may spend hours planning content and perfecting captions for your social media accounts, but you don’t own those platforms. That means you could lose it all in the blink of an eye. Whether your account gets hacked, someone reports your account as spam, or the platform shuts down out of the blue, you could lose your content and followers without warning. If you lose access to your social media and the followers you worked so hard to get, how will you contact your audience? Social media can be so frustrating. The algorithm is constantly changing and the sad truth is, even if you’re posting quality content every time, only a small percentage of your followers are seeing it. So, the chances of your audience missing your best content or important information is sky high. 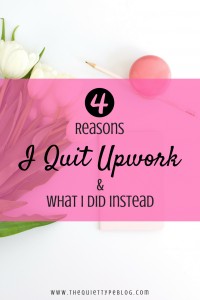 Spending so much time on what you’re putting out there for such a small payoff can make you feel defeated. Even worse than that, it can make you question whether all the work is worth it. With an email list, you control what your audience sees because it’s being delivered directly to their inbox. That means your audience sees the important messages and the content is delivered in the exact order it’s meant to be seen. There are so many benefits to having an email list but one of the best is having a direct line of communication with your target audience. Regardless of the reason for opting in, your audience wants to hear from you. Having an email list of authentic followers gives you a platform to be more personable with your audience and let them get to know you. It also works the other way around because you’re able to learn more about them. Having this direct line to your audience will help you serve them better and when they know you care about what they have to say, it builds trust and loyalty. Using your email list strategically can generate more traffic for your website, increase your social shares, and grow your social media presence? Email is much more personal than writing a blog post because it lets you talk directly to your audience in a one-on-one, informal setting. Doing so creates a deeper connection with your reader and they’re more likely to act on your invitation to follow you on social media, hit reply and answer your question, or share your latest post on Pinterest. You don’t want to be just another voice on the internet. You want to be a trusted resource for your audience. The content you put out on your website or blog goes a long way in building credibility with your audience, but it doesn’t stop there. Your email list plays a part, too. The primary focus of what you send your list should be continuing to serve them in a way that’s useful. Sure, you may want to use your list to make money but in order to get people to buy from you, they need to see you as a trusted source. …Are you starting to sense an overall theme here? Instead of focusing solely on selling to your list, focus on serving them first. Do this by sharing insider information or helpful tips and tricks. Your audience will see you not only as an expert in your niche, but also as someone who’s opinion they value. Before you know it, you’ll be a go-to resource for your audience. If you want to sell digital products or services or make money blogging through affiliate marketing, an email will be your biggest asset. The people on your email list are genuinely invested and engaged, giving you the opportunity to created target content that actually serves them. It’s important to note here that constantly sending your email list spammy, sales driven emails will have people hitting “unsubscribe” without thinking twice. Don’t do that! Instead, focus on how you can serve them FIRST and making money second. Continually offering high quality, helpful content for free is what is going to build trust with your email list and encourage them to buy when the time comes. Now that you know why email lists are so important, it’s time to stop putting off starting your email list and just do it! Thanks Sasha, I’m glad you enjoyed it! I put off focusing on my email list for a long time but I’m so glad I decided to make it a priority. Good luck! So true about the algorithms! Instagram is making me want to bash my head against my desk at this point. There is no rhyme or reason to it (or so it seems). I’m all about connecting with people, so I might need to refocus my efforts on getting a direct link to my audience rather than a roundabout ‘maybe’ connection with them! Thanks for this post, it has a lot of good points!